The Faber Electroacoustics Toolbox (FEaT) is a modularized, multi-channel multi-analyzer, offering real-time data acquisition and analysis of electrical, acoustical, and electroacoustic signals and systems. FEaT brings powerful new tools to the Macintosh platform for multi-channel, audio-band data acquisition and real-time analysis of electrical, acoustical, and electroacoustic signals and systems. Electroacoustics Toolbox enables precision measurements of acoustic quantities, such as equivalent and time-weighted sound levels, as well as acoustic and electroacoustic systems, such as listening rooms and loudspeakers. The software is designed to work with any Mac-compatible audio hardware and supports multiple channels of 8, 16, 24, or 32-bit data with sample rates as high as the hardware will support. Mac OS version 10.7 or later. An issue with channel sensitivity adjustments in the Meter Bridge and Sound Level Meter tools has been addressed. When loading Room Analyzer tools from a project file, if a permissions error occurs for an audio file being used for analysis, an Open dialog will be presented with the file in question selected. Once the file is then manually loaded via the dialog, the permissions will be properly set for the next time the project is loaded. This is an issue with sandboxed copies of Electroacoustics Toolbox downloaded from the Mac App Store. The Room Analyzer tool’s plotting is more reliable when loading the tool from a project file on recent versions of Mac OS X. This update corrects an issue that could prevent captured data from being successfully exported from the Dual FFT Analyzer tool using the Export All command. Each app directly supports the miniDSP UMIK-1 and Dayton UMM-6 USB measurement microphones. Sensitivity calibration data for these mics can be downloaded automatically, just by entering the mic’s serial number. Making calibrated sound level measurements is as easy as plugging in the UMIK-1 or UMM-6, typing in its serial number, and getting started with the analysis tool of your choice (the serial number only needs to be entered once, after which the app will remember the microphone sensitivity). An internet connection is required to download sensitivity information for the microphone. Each of these apps also directly supports the Digiducer 333D01 USB digital accelerometer, and can automatically load serial number and sensitivity calibration information directly from the device. Making calibrated acceleration measurements is as easy as plugging in the 333D01 and getting started with the analysis tool of your choice. Various bugs and potential instabilities in each app have been corrected. These apps all require Mac OS version 10.7 or later. All Faber apps for Mac OS received updates to improve their compatibility with Yosemite (Mac OS 10.10). 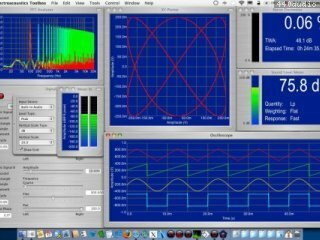 Electroacoustics Toolbox 3.7, SignalScope Pro 3.7, SignalScope 3.7 and SignalSuite 4.7 are all 64-bit applications that have been built for Yosemite. The Room Analyzer tool, available for in-app purchase in Electroacoustics Toolbox, now calculates room parameters in whole or 1/3-octave frequency bands from impulse response data that has been sampled at higher sample rates (88.2, 96, 176.4, and 192 kHz), in addition to sample rates of 44.1 and 48 kHz that were supported previously. The Octave Analyzer tool, found in both Electroacoustics Toolbox and SignalScope Pro, also now supports the higher sample rates for real-time spectral analysis of input signals in whole or 1/3-octave frequency bands. The Dual FFT Analyzer (only in Electroacoustics Toolbox) and FFT Analyzer tools now support additional dB vertical scale factors of 3, 6, 9, 12, 15, or 18 dB per division in the graphic display. Version 3.5 of Electroacoustics Toolbox extends AppleScript support to the Room Analyzer tool (sold separately), which enables automated room acoustics analysis and data retrieval via AppleScript. Now, in addition to automating the acquisition of impulse response data, users can employ AppleScript to control the analysis of that data to extract relevant room acoustics parameters. With increased automation capabilities, the Room Analyzer tool also now takes additional steps to verify the accuracy of acoustic decay time estimates, including T20, T30, T60, and EDT. For each of these parameters a nonlinearity value (in per mille, or parts per thousand) indicates how close the acoustic decay approaches a straight line, which is the basic assumption in reverberation time estimation. A nonlinearity value greater than 10 suggests that the user might want to take a closer look at the data to determine whether adjustments must be made to the integration limits for the decay curve to get a more accurate measurement. Room acoustics parameters are properly plotted across 1/3-octave bands in the Room Analyzer tool. Radio buttons are properly deselected in the IR source drawer of the Room Analyzer tool when switching between Dual FFT or Oscilloscope measurements. A bug has been addressed that could prevent the “Try” buttons in the project window from successfully opening a trial of the Noise Dosimeter or Room Analyzer tool. All Faber apps for Mac have been updated to make more efficient use of resources. Two issues have been corrected which could potentially lead to excessive memory use. This update addresses plot freezing issues on Mac OS 10.9 (Mavericks). SLM and Octave Analyzer tools operate more efficiently. A potential crash has been addressed in the Signal Generator tool. �� Electroacoustics Toolbox now offers two additional tools for sale within the app. These new tools include a Room Acoustics Analyzer and a Noise Dosimeter (similar to the Dosimeter tool offered in earlier versions of the Toolbox). • The new Room Analyzer tool employs the integrated impulse response method for calculating the acoustical parameters of a room. Schroeder reverse integration of the squared impulse response produces a decay curve, from which the Room Analyzer calculates reverberation time (RT60), early decay time (EDT), center time (Ts), clarity, and definition for the entire audio frequency band and in whole or 1/3-octave frequency bands. • The Noise Dosimeter tool measures daily noise dose according to standard methods (a calibrated measurement microphone is required to make repeatable, accurate measurements). The noise dosimeter offers criterion sound levels of 80, 85, and 90 dB with 3, 4, and 5 dB exchange rates. • Version 3.2 also fixes various bugs. �� Help files now open in the default web browser. • Help is now available from within the app as a PDF file. • Spectrogram behavior upon loading from a project file has been improved. • The stability of all FFT-based tools has been improved. • Other minor and cosmetic issues have been addressed. Version 3.0.5 is a maintenance release. Version 3.0.4 is a maintenance release. Corrects a bug that prevented proper saving of wave and AIFF audio files in the SLM and Signal Generator tools. Corrects an issue that could cause a crash when removing a Spectrogram tool from the current project (it typically occurred when closing a project). * Version 3 sports an improved user interface. * User preferences are available for individual tools. * Default audio device configurations, including channel labels, units, and sensitivity can be saved. * Virtual input channels can be added to audio input devices. Two-channel signal arithmetic (add, subtract, multiply) is now supported. * Arbitrary FFT lengths may be specified in FFT-based analysis tools. * Sound Level Meter and Octave Analyzer tools support percentile-exceeded sound levels. 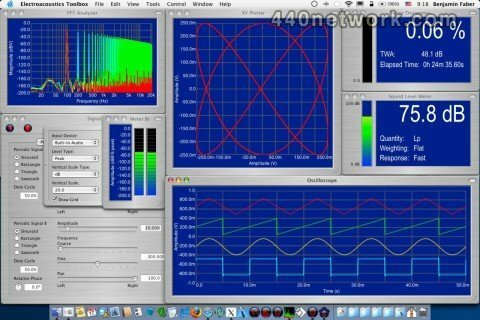 * Extended low-frequency support has been added to the Octave Analyzer. * The Spectrogram supports log frequency scales and real-time 3D spectrogram display. * Version 3 includes various other improvements over previous versions. * The Toolbox may now be purchased and maintained through the Mac App Store. * Channel count changes for multi-channel audio devices are handled dynamically, avoiding potential crashes. * Several other minor bugs have been corrected. * Output channels of certain multi-channel audio interfaces, such as the MOTU UltraLite mk3, are properly enumerated. * Audio device channel gains on certain devices, such as the Wavelength Proton USB DAC, are properly restored when opening project files. * The reference delay value in the Dual FFT Analyzer tool's function table is presented with greater precision. Version 2.1.8 is a maintenance release that improves the stability of the application. * Dual FFT Analyzer: Added AppleScript access to the IR data window indices in the individual dual fft analyzer objects. * Dual FFT Analyzer: The windowed IR FFT length is now set somewhat arbitrarily to be as small as possible for the selected IR window. It is no longer constrained to be one of the user-selectable FFT lengths. * Dual FFT Analyzer: When the source or reference channel of a Dual FFT Analyzer channel gets set via AppleScript, the channel's sensitivity, units, and label values also get refreshed. * Dual FFT Analyzer: The time and time shift vectors are written with the correct (effective) sample period when data is exported to mat or text files. Version 2.1.7 is a maintenance release that improves application stability. * The Dual FFT Analyzer now supports user-definable time delay of the reference input for each live measurement. * A bug was fixed that led to a potential crash when computing an impulse response. * The recent projects menu gets updated properly again. * Impulse time weighting now passes the tone burst tests specified in ANSI S1.4. * Some AppleScript behaviors were corrected. * This release includes other minor bug fixes, stability enhancements, and cosmetic refinements. Version 2.1.1 is a maintenance release, which corrects data export problems in the DFFT Analyzer, which occurred when a window was applied to the impulse response. It also corrects some minor cosmetic issues. Version 2.1 improves compatibility with Snow Leopard (Mac OS X, version 10.6). • Transfer function measurements can be corrected by previous captured measurements. • Memory management and stability have been improved. • Product updates can now be automatically retrieved and installed. • Individual input channel calibration is now possible within the Device I/O Setup window. • Some oscilloscope triggering issues have been corrected. • Other minor bugs and cosmetic issues have been corrected. Version 2.0.3 is a maintenance release, which improves the performance of the fractional octave band filters and fixes menu commands and keyboard shortcuts for the primary data cursor in the Octave Analyzer. Version 2.0.1 is a maintenance release, which fixes several bugs. ⁃ The normalized cross-correlation is normalized by the actual cross-correlation coefficient, rather than by the peak value of the cross-correlation function. Electroacoustics Toolbox now supports quasi-anechoic frequency response measurements. The measured impulse response can be truncated (windowed), which will cause the transfer function measurements to be recomputed based in the shortened impulse response. The Meter Bridge tool now correctly saves and restores its selected input device. The Dual FFT Analyzer's auto-scale function always sets the vertical scale to 0.2 per division when viewing cross correlation data. Using reduced frequency spans in the Dual FFT Analyzer could previously result in corrupted measurements when using the analyzer's built-in excitation signal. This has been repaired. Oscilloscope displays are more robust, particularly for large time scales. The Spectrogram 3D display no longer gets reset when clicking the Stop All button in the project window. Applescript is now supported by the feature-limited, 30-day demo. Several other bugs have been fixed. Electroacoustics Toolbox is now scriptable! Projects, measurements, data capture and export, and even displays can now be manipulated and automated via AppleScript. - The project window has been enhanced with a toolbar and additional functions that are available within the project toolbox outline. Each tool now has its own icon, which can be added to the project window toolbar for one-click addition of new tools to the toolbox. - Controls have been added to send start/stop, capture, and export messages to all tools in the project toolbox. - Data can now be exported to MAT-files, in addition to ascii text files. - The Dual FFT Analyzer now includes a built-in signal generator to simplify the measurement process. The excitation signal can be configured in the Excitation tab in the analyzer window's Controls drawer. - The Dual FFT Analyzer now allows only a single live input channel to be selected, making single-channel autospectrum or autocorrelation measurements less cumbersome. - The Spectrogram display no longer draws a blank image when displaying large data sets in 2D Fast mode. Also, for some configurations, the 2D Fast mode is automatically selected/or deselected to ensure the display of a proper image. - The Spectrogram 3D surface plot is now clipped at the boundaries defined by the floor and ceiling values. - A new option in the Preferences, enables the user to choose whether Electroacoustics Toolbox should create a new project, open the most recent project, or prompt the user for a decision when it launches. - Electroacoustics Toolbox now supports a feature-limited demo mode, which does not require a serial number to activate. - Eliminated a lockup, which could cause audio I/O to halt when a long FFT was being computed. - FFT and Dual FFT axis labels should be drawn correctly when viewing captured data, particularly when viewing time domain data in the Dual FFT Analyzer. - The XY Plotter window has a much smaller minimum size. - The Bartlett data window type is now implemented correctly. - A third tutorial has been added to the Help files. - Numerous improvements have been made to enhance the user experience and improve the stability of the application.